One of the greatest Gothic horror novels to grace written history has, in the hands of Acme Studios, given birth to what must be one of the greatest writing instruments in recent memory. Blood red ink. A fantastical, cathedral-inspired nib. A creature of the night, gleaming golden against a jet-black barrel. This exquisite limited edition fountain pen isn’t a mere pen, but a true writing experience. From its faux leather-bound case that so closely resembles a book, to the musical coffin in which the pen lies like its vampiric namesake, the Dracula Limited Edition Pen Set is a true celebration of the Gothic genre and the influential imagination of author Bram Stoker. Able to be converted in to a rollerball pen with a swift change of its tip, this pen set will both impress and mystify, just as Stoker’s Dracula did so very long ago. Designed by Acme Studios in the USA. Celebrates 100 years since the death of Dracula author Bram Stoker. Interchangeable pen format allows the single pen to be used as a fountain pen, or a rollerball pen. Gorgeous high-gloss barrel with gold-tone appointments. Fantastically detailed grip resembles cathedral windows. 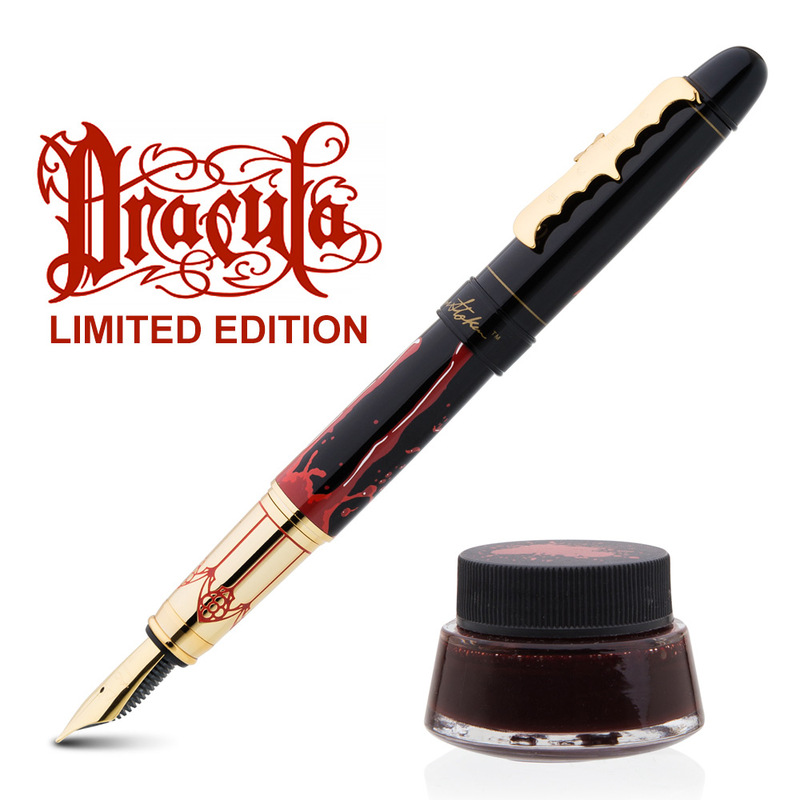 Includes a pot of deep red ink. Pen rests in a coffin, which plays Fugue in 'D' Minor upon opening. Gorgeously presented in a gift box, assembled to resemble a book.